Robbie Turner: The story can resume. Tap tap tap goes the typewriter. The tapping is coming faster and hitting harder. The pace is set and the race has officially started. 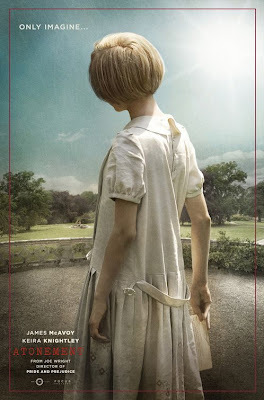 Director, Joe Wright’s ATONEMENT bursts out of the gate from the moment it starts, as a pan away from a modeled replica of the Tallis manor reveals a parade of toy animals and ends aptly on the purported queen of this particular animal kingdom, Briony Tallis (Saoirse Ronan). Briony is only thirteen years old but she is just about to finish her very first play. This precocious child is captivating. She is at once frightening while just as frightened. Her focus is eerily burning and her need for command of the situation and those involved motivate her every decision. On this particularly sweltering day, Briony believes her play to be her greatest accomplishment yet and sees her future more brightly boundless than even before. She has no idea that everything is about to crumble beneath her. Chance allows her to witness a few things she was not meant to and before long she makes a desperate play to regain control of her destiny. Who knew that one little girl could cause so much trouble for so many people and invite turmoil into her family for the rest of her days by telling one misguided lie? 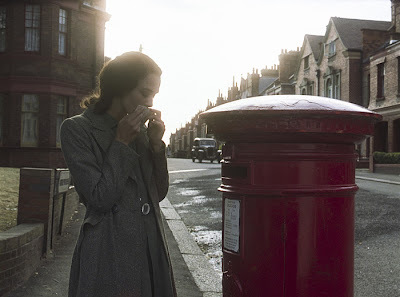 When Briony falsely accuses Robbie (James McAvoy), her sister, Cecilia’s (Keira Knightly) lover, of a horrible crime, he is arrested and sent to prison. It isn’t clear whether Briony was aware of how serious her accusations were or how far Robbie would be taken from Cecilia and his future as a result but it is clear that she interrupted a love of immense proportion. ATONEMENT’s first act goes back and forth between Briony’s breakdown and the escalating sexual tension between Robbie and Cecilia. Cecilia is not your typical period drama maiden. She is provocative and sharp-tongued. For all her fierce self-awareness though, she has made a point to repress her longing for Robbie out of respect for status. Robbie too has been hiding how he feels to appease the rules that apply to status and boundaries, not so much out of respect though but rather for blind tradition. Society’s restraints cannot hold back a love of this magnitude. The passion bustling between them is palpable and exacerbated by the heat; it is no wonder that it all comes to a head on this fated day and is halted no sooner than it is just begun. As they are only given the chance to whet their lips with each other’s taste before being ripped apart, theirs is a relationship that will live in a suspended state of foreplay for a long time to come. 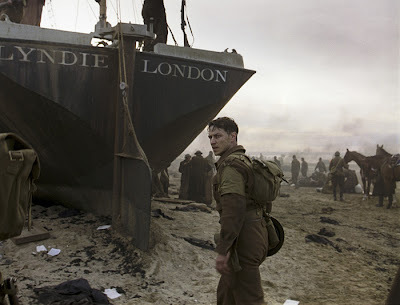 When Robbie is taken prisoner, ATONEMENT shifts into a new and noticeably different movement. The intensity carefully crafted in the first act dissipates as the characters enter their own individual limbos, left to meander aimlessly in search of repair. The build toward Briony’s lie was punctuated by a sharp, concise score by Dario Marianelli and highlighted by Seamus McGarvey’s bright and elegantly fluid cinematography. Both artists employ entirely new approaches toward the action that unfolds in the lie’s aftermath. The score becomes dark, somber – less driven and more haunting. The visuals follow suit, feeling heavy and dense. The change halts the flow of the film and feels like a misstep momentarily. Once you catch the breath you were holding previously, the severity of the scenario sinks in and the fresh aesthetic takes on its own significance. It cannot help but feel longer or slower in comparison but how else are we or the characters expected to feel when they are living their new lives lost and haunted by a past they could not control? Besides being relevant to the tone of the story, the shift also gives birth to a four and a half minute shot depicting the 1940 evacuation at Dunkirk Beach that is mesmerizing in its grace and awesome in scope. ATONEMENT is a fresh and surprising spectacle. Wright impressed with charm and poise last time out in 2005’s PRIDE AND PREJUDICE (also starring Knightly) but his latest grabs the period drama by its snotty superiority and turns it inside out, thanks in no small part to Ian McEwan’s much loved novel of the same name. The gravity of how one bad decision can ruin many lives resonates loudly and the guilt that follows gives way to the need for forgiveness from those who were hurt and from the one that caused the pain. ATONEMENT does not judge Briony for what she’s done; instead it allows her the chance to heal and make things right without ever presuming that her recovery is inevitable. For breaking convention and for demonstrating sincere respect for the story, the characters and the audience, Wright has absolutely nothing to be sorry for. How many sheep would you give Atonement? I though S.Ronan, the young Briony, gave the film’s best performance. I felt Cecelia and Robbie refusing to forgive Briony was more tragic than the short-lived romance. The screenplay just didn’t allow me to care for the romance. Perhaps the novel does a better job of elaborating on it. A very good film but not an instant classic.